We sat upstairs which looks over the coffee counter where the baristas work. The interior has a pretty and cute/quirky look. 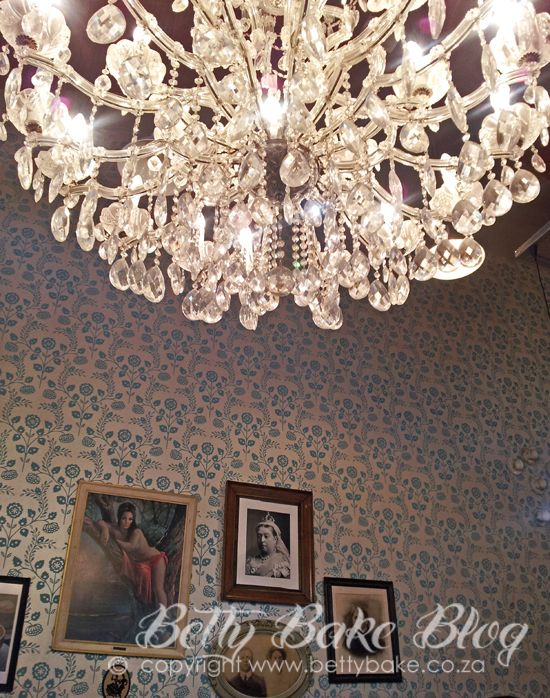 Cute wall paper, pretty chandelier, vintage teacups on the walls and old photos and paintings. Coffee was nice. We also shared a baguette/sandwich with muchrooms and peppers on it - it was tasty. PLEASE NOTE: Vovo Telo did not ask me to write about them. I wasn't compensated in anyway for this blog post and the bill was paid by ourselves. They weren't even aware we were there. LOL - this is true! I love Vovo Telo! Discovered them when they first opened earlier this year and just love the experience! Their pastries, sandwiches and pizzas are all so tasty! Coffee is fabulous! Sounds so good - I definitely need to go back! Yay! Finally something we had in PE before you guys, so I don't need to sit here reading this and feeling jealous.